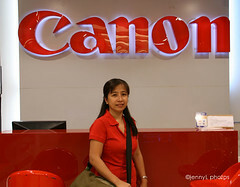 I went at Canon Store in Megamall last Sunday to have my 50mm lens checked bec. I recently broke it. I was wrong bec. the Canon store in Mega was not a service center but a show room and store for all Canon products so my broken lens was not fixed yet. 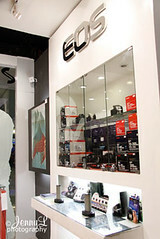 I had the chance to shoot some of their displayed camera, the P&S and their EOS cameras and I am still drooling over them eventhough I already have my own. 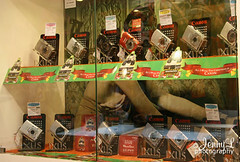 The sales attendants there were all accommodating so I had also the chance to hold the Canon 50d camera which I must say is a nice camera to have. It captures crisp and good photos that you don;t need to edit on photoshop. After some time at Canon store, I strolled all the shops in there like Cinderella, SM, Celine and more. I even went inside the Fossil store and looked at the Fossil watches that they have on display. I have few fossil watches that I have bought through the years. After a tiring day at the mall I decided to go home already. Hi there...just "dropping" in and noticed that this might be a good place to ask advice on a GOOD, medium price range, camera. I love taking pictures of scenery and also have items for sale that I'd like to photograph. Any suggestions you might have would be greatly appreciated. You can leave a reply here or on my blog http://morethansewso.com Thanks! Hi jenni...I replied to your comment on my site, but I wanted your opinion on the camera I have. It's a Sony, Cybershot 7.2 but I just can't seem to get good pictures from it. I don't know whether it's me or the camera. My son has one and he gets excellent pictures. Maybe I don't know how to use the settings, but it's extremely frustrating. My daughter and I are going on a cruise to the Bahamas and I surely would hate not to have a good camera with me. Thanks again.